+ Tools Help You Design Your Line & Find a Manufacturer For It! The Official Step by Step Guide to Starting a Clothing Line Course – 4th Edition is even more powerful! It is now 3 Books In One, designed to give you everything you need to tackle launching your own line in one source! It contains the original Step by Step Guide to Starting A Clothing Book + The Reality of Owning and Operating Your Own Clothing Line + How to Effectively Sell Your Clothing Line to Retailers! This course is actual taught in many schools and have helped countless designers around the world break into the fashion business & launch their own fashion brands. Brief Description of Official Step by Step Guide To Starting A Clothing Line Course 4th Edition: How to set your clothing business up – and create your business plan. How to raise money to fund your line. How to trademark your company logo. How to work with clothing manufacturers so that you get the most out of the relationship without losing money. How to get manufacturers to do small quantities. How to ensure product quality, what to look for and much more. Start Living Your Fashion Dream Today With Great Information to Guide You! Order This Course Today! Just $95 USD On Sale Today! Regular Price: $150. This is the course book that will help you launch your clothing line in a big way like a pro! This guide is a very informative step by step manual that will educate you on how to create your own clothing line from scratch the right way and the most least expensive way. It covers everything you need to know and more! It will teach you how to cut corners and save a lot of money along the way. This course will show you how to raise the capital you need to start your clothing line.. If you want your line in stores – you will be glad you read this book first. You will learn the ins and outs of selling your line to retailers. Learn the jargon and more! Learn the do’s and don’ts of selling your line. Store owners have revealed what they look for in new lines and this book has it all right at your fingertips! This book is like having a personal mentor based on the way it walks you step by step through the maze of the fashion industry so that you can be confident about going fourth with your line. This course is worth far more than the cover price as it gives great insider information that a consultant would charge you hundreds or even thousands for. This book is the best investment you can make if your goal is to build a successful fashion brand. This book covers all these areas and much more! You will also learn about the everyday problems clothing line owners face in the fashion industry and how to triumph over them to achieve success. The 10 Keys to success in fashion as well as the top 10 things you definitely have to avoid to stay in business. This course will keep you ahead and give you the edge over most companies in the business. We help make starting and designing your clothing line easier by giving you the business tools you need to be successful. Our clients spend less money starting their line because they know exactly what to do. If you are starting a line – give yourself the edge and knowledge to be great at it! Here is how you can also find a manufacturer plus get a tool to create your designs. So don’t just start a clothing line – Give It The Competitive Edge in the Billion Dollar Per Year Global Fashion Industry with The Official Step by Step Guide to Starting a Clothing Line Course! The clothing industry is a 90 billion dollar per year industry that is constantly growing. It is our intent in this manual to give you a down to earth comprehensive look at what you will need to get going and stay going in this business. Whether you want to design leather, denim or accessories our manual will put you on the right track. This manual will allow you to start and establish your clothing line with the confidence of a person that has been in the business for years. Our course is full of real world experience. How to set your clothing business up – and create your business plan. How to trademark your company logo. How to work with clothing manufacturers so that you get the most out of the relationship without losing money. How to get manufacturers to do small quantities. How to ensure product quality and what to look for. How to import your clothing into your country and much more! HA Ultimate List of Clothing Manufacturers eBook – 500 Worldwide Manufacturing Contacts & Factories Which Includes Ones In Your Country Too! The clothing manufacturers on our list make all types of apparel and accessories. Many have worked with top apparel brands. Clothing manufacturers on this list are from all over the world including Apparel Factories in USA, Australia, United Kingdom, Canada, Italy, India, China, Hong Kong, South Korea, Istanbul, Pakistan, Taiwan, India, Mexico, Singapore and more. Some of their specialties are denim, jeans, dresses, t-shirts, skirts, sweaters, jackets, coats, athletic wear, hats, buttons, shoes, designer glasses, handbags, socks and more, plus screen printers, embroidery services, blank tees, blank hats, graders, and fabric houses! As a new designer or clothing line – it is important to try to work with a few manufacturers. You do not want to have all of your eggs in one basket. Our Ultimate List of Manufacturers can you avoid that. This list just makes finding an apparel factory really easy and saves you a lot of time..
Super 1 Day Sale $95 (Regularly $150). Get this item now during our Super Sale to Save! You will be able to download this item after purchase – Only When Purchasing This Item Separately. Note: We do not endorse or guarantee any manufacturer or company on the Ultimate List. Use the list at your own discretion. Buy It Separately Or Get It For Free Inside of Our Fashion Mogul Package. The Official Step by Step Guide to Starting a Clothing Line Course – 4th Edition is even more powerful! 3 Books In One, designed to give you everything you need to tackle launching your own line in one source! 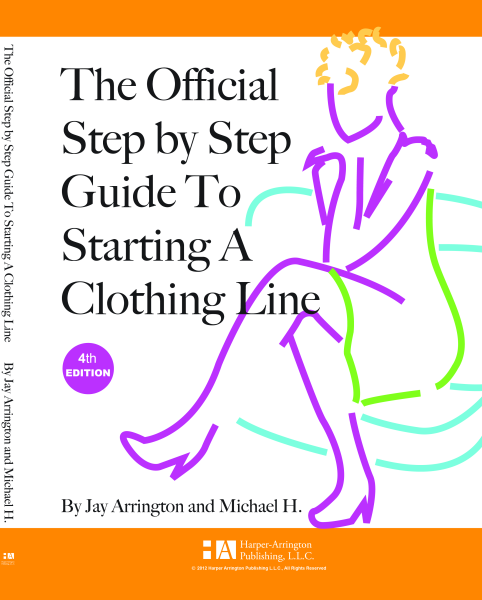 It contains the original Step by Step Guide to Starting A Clothing Book + The Reality of Owning and Operating Your Own Clothing Line + How to Effectively Sell Your Clothing Line to Retailers! This course is actual taught in many schools and have helped countless designers around the world break into the fashion business. 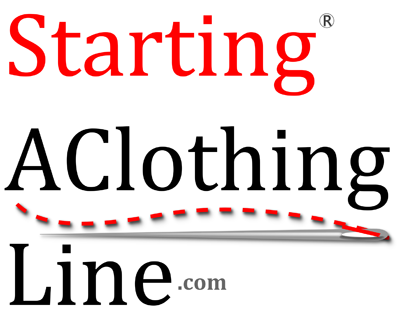 Brief Description of Official Step by Step Guide To Starting A Clothing Line Course 4th Edition: How to set your clothing business up – and create your business plan. How to raise money to fund your line. How to trademark your company logo. How to work with clothing manufacturers so that you get the most out of the relationship without losing money. How to get manufacturers to do small quantities. How to ensure product quality, what to look out for and much more.This is an truly valuable resource for clothing line start-ups. Just $95 USD On Sale Today! Regular Price: $150. Or get it inside of the Fashion Mogul Kit. The Fashion Business Center was created to give fashion entrepreneurs the financial tools and training needed to successfully plan out a clothing line, execute spec sheets, catalogs, line sheets, tradeshows, style forecasting and much more. This tool will also come in handy while you are creating your business plan. It takes the guess work out of financial planning & forecasting. Spec Sheets / Tech Packs: If you want to get your clothing line made there are few things you need. You need sketches (regular and technical sketches) + a spec sheet detailing your design. The Fashion Business Center helps with the Spec Sheet issue. It has a host of specification sheet templates so that you can add details about how to make your line. This document is the single most important thing you need to get your clothing made. Order the Fashion Business Center today if you are planning on getting your line made at a factory. Just $125 on Sale Today! Regular Price $150. This item is also included in the Fashion Mogul Kit. 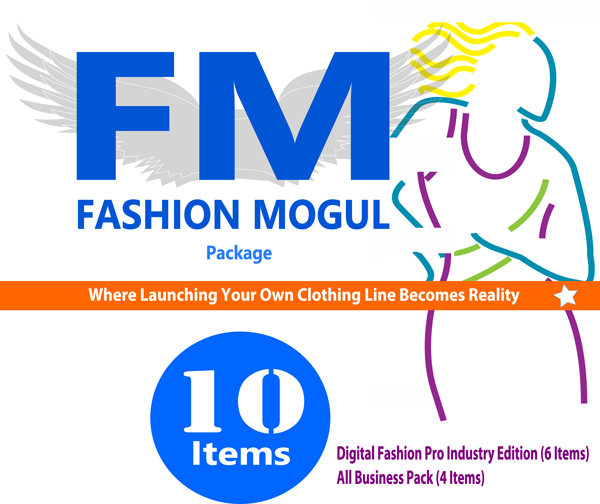 Fashion Mogul Package – 10 Items! Our Solution That Can Help You Start Your Line, Design It, Get It Made & In Stores. + Get The Ultimate List of Clothing Manufacturers List Free With This Package! Buy: The Fashion Mogul Package – 10 Awesome Items! Special Offer: $1199 Just $475 Right Now – Don’t Miss This Super Deal! Get the Tools To Design & Launch Your Own Professional Fashion Label. This complete package walks you through starting your line, the tools to design it, getting it made & in stores! Perfect For Beginners & Fashion Entrepreneurs who want the competitive edge & the know how to navigate the fashion industry with precision! 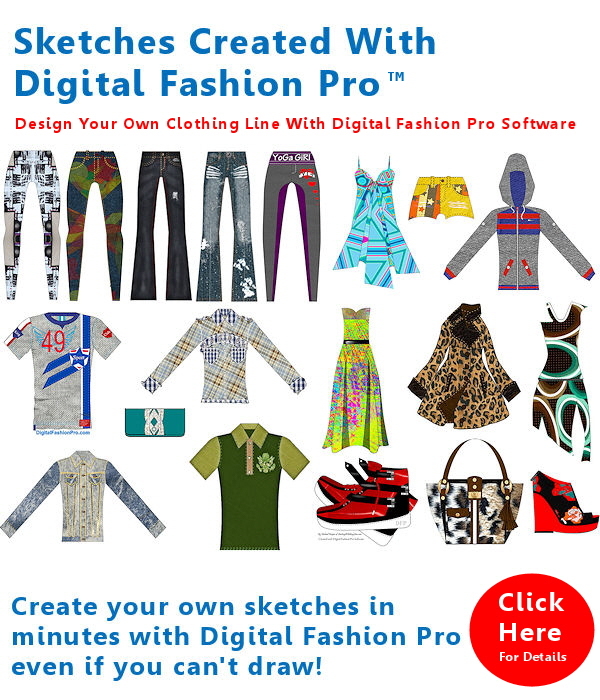 Fashion Mogul Includes Digital Fashion Pro V9 Industry Edition Fashion Design Software which allows you to Design Almost Any Style for Any Market Even If You Can’t Draw or Have Experience. The Official Step by Step Guide to Starting a Clothing Line Course which will walk you through how to start your own clothing line from scratch as a beginner with a limited budget. It covers The Business of Launching Your Own Label. 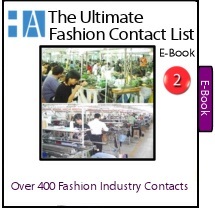 The Ultimate Fashion Contact List eBook of 500 Global Manufacturers and Factories which includes sample makers, small production run factories and mass production. This list includes manufacturers from the USA, United Kingdom, Canada, Australia, China, India, Taiwan, Italy, Vietnam, Hong Kong, Japan, South Korea and more! Get All The Basic V9, Business Class & Industry Edition Features: Templates for Jeans, T-shirts, Pants, Shorts, Polos, Tank Tops, 2 T-Shape Model Poses, Step by Step Training + Ability to Design Dresses, Skirts, Hoodies, Coats, Jackets, Sportswear, Sweaters, Tops, Button Downs, Swimwear, Shoes, Handbags, Designer Denim, Baby Clothing + 1400 Extra Digital Fabric Files + How to Create Technical Sketches & Work With Artwork / Graphics Training..
5. Retailers List eBook (Free With Package – It has no monetary value) . Super Sale Price: Just $475! Regular Piece Price when purchased individually is $1199. Don’t Miss This Super Special Offer! Sale price & offers are subject to change or end without notice. This price is not guaranteed to last all day!